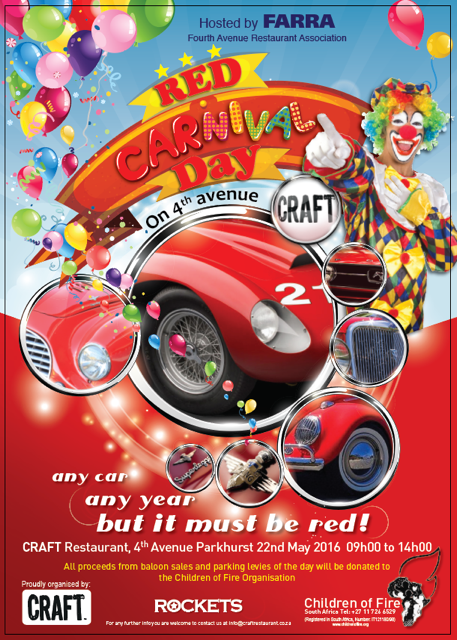 Craft Restaurant in Parkhurst in collaboration with Rocket Restaurant are currently organizing a Red Carnival Day. The fundraising event will take place on Sunday the 22nd of May from 9am till 2pm and will be hosted by the Fourth Avenue Restaurant Association. The day promises to be a fun-filled spectacle with red super cars, red classics, red vintage cars, a fire engine from our local station and red bikes parked along the entire Fourth Avenue Business Node. Parking along Fourth Avenue will be exclusive to any red vehicle the owner of which will be expected to pay a parking fee as a donation towards Children of Fire Charity. Clowns will be present outside each participating restaurant and will be tasked with selling red balloons to raise funds on behalf of the charity set up to help young survivors of burn injuries (whether by fire, chemicals, electricity or hot liquids) and to help and educate the communities in which they live, providing both prevention and cure. Members of the public, residents and owners of any red motor vehicle are invited to visit Fourth Avenue, Parkhurst on the day and make a significant donation. Please support the Charity www.childrenoffire.org and help change a burnt child’s life, the organization is under immense pressure and in desperate need of your contribution. Donations to the Children of Fire trust First National Bank, Melville (branch number: 256505), account number 61492023919.